Touring kayaks are a nice middle ground between recreational kayaks and sea kayaks. In this article, we will dig deep into what makes a good touring kayak. Today, we will look at the best touring kayak reviews of 2019. What Defines a Touring Kayak? Types of Water: Touring kayaks are best used in bays, lakes, currents, moving water, and some ocean. Adventure Kayak Magazine gives some video advice below on how to improve skills on river currents. Trip Duration: You can use touring kayaks for anything as short as a day or as long as a weekend. Less than 20 miles is common, but you are really only limited by your imagination. Skill Level: Touring kayaks are not for beginners. That being said, we recommend only intermediate to advanced paddlers take on this kind of craft. It is best to work your way up to touring. Storage Capacity: Since touring kayaks can be used for multi-day trips, they have good storage capacity. On that note, look for a craft that can hold everything you want to bring on your journey! Manageability: Touring kayaks are pretty easy to manage, but not the easiest since they are so long. Overall, they aren’t the worst to carry, attach to the car, or store when not using in the water. 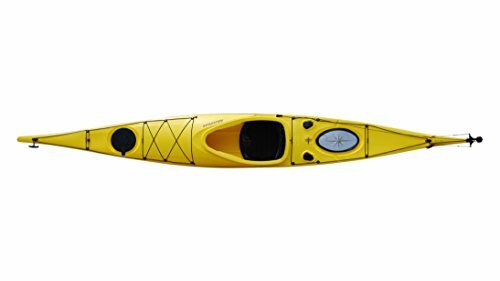 Speed: This type of kayak can glide through the water with the greatest of ease! The best touring kayaks are efficient moving at fast speeds. In fact, they are specially designed to get you where you are going in a timely manner. Tracking: This is the kayak’s ability to stay on a straight course. The touring variety is very good at tracking. Without the ability to follow a straight line, it wouldn’t matter how far or how fast the kayak could go. Maneuverability: Touring kayaks are masters at maneuverability. Even though they are long, they can still weave in and out of small spaces precisely. If you plan on getting in rough water, touring kayaks are designed to track and lift in currents. How do You Choose a Touring Kayak? You can’t talk about the best touring kayak without talking about hulls. There are 2 primary types of materials hulls are made of: plastic (polyethylene) and composite (fiberglass). Remember, composites cost more but weigh less. Composite hulls are rigid and the rigidity means your kayak will be more responsive. Plastic hulls are more flexible and won’t get as hurt if you knock into a rock. You can even repair them quite easily by using the same stuff as skiers and snowboarders. Composite hulls are more likely to crack and more costly to repair. They also cost more in general. Both materials can do well in touring kayak form! A Rudder, Skeg or Neither? Do you want a rudder, a skeg, or neither? Rudders control your kayak, skegs help with tracking, and edging techniques feature neither. Rudders can be back and forth, but skegs cannot. You will still have to use your paddle. You can retract skegs, but they take up valuable space that could be used for storage. Rudders sit on the top of the touring kayak when not in use. Remember that when you consider your storage needs. Using neither requires significant skill and technique. Think about how big the cockpit is, and how big you are. You need to choose a kayak that is comfortable because you will be sitting for a long while. Make sure there is a thigh brace and/or an adjustable backrest to help you stay safe. The fit of the cockpit to your body should be snug if you plan on taking your touring kayak on windy or rough waters. It helps you keep control over the craft. Still, you need the cockpit to be large enough you can exit if you have to self-rescue. The most common types of touring kayaks are the sit-inside variety. Since you are actually inside of the craft, you will have more control in choppy water. Sit-insides also track better and can handle high winds and dicey currents. You can find day touring and regular touring sit-inside kayaks. The day touring variety is shorter and hold a moderate amount of stuff. Regular touring, also referred to as sea touring, kayaks are longer and better equipped to handle multi-day journeys. You can fit a sit-on-top kayak for long trips. However, you will want to restrict your journey to calmer waters. Your tracking and your ability to handle wild currents and waters will depend more on your ability than your craft. At 14 feet and 5 inches, the Edge Flatwater Day Touring Kayak is a good sized craft. The width is 22.5 inches, and the whole thing weighs only 60 pounds. 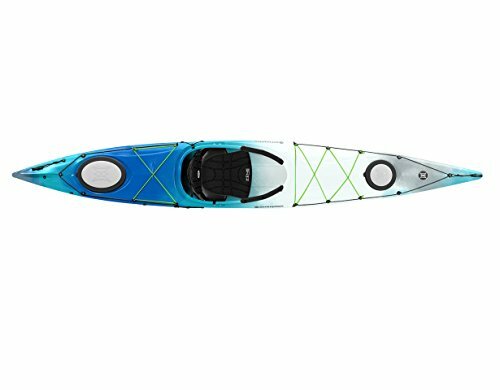 As is usual for touring kayaks, this Edge features a slender design and deck line for speedy movement through the water. You can easily maneuver with the included pilot rudder system. Additionally, there are plenty of added bonuses that make this Riot Kayak comfortable for most body types. The seat is an advanced custom fit, the foot braces are adjustable, and there are thigh braces. Not only is there a rudder, but there is also a retractable skeg. This helps with tracking to make the whole day’s navigation easier. Despite the used room for the skeg, there is a 15.75 by 8.13-inch water resistant hatch and bungee cords for your stuff. The Brooklyn Kayak Company UH-SK287 Touring Kayak is one for the books! You can use this 14-foot and 11-inch craft in freshwater or seawater, but it really shines in choppy ocean currents! Furthermore, it weighs only 55 pounds but can hold anyone up to 250 with gear. For overnights, there is an ample amount of storage. The UH-SK287 has 2 water resistant hatches in the hull, as well as cargo room covered with bungees and tie downs. If you want to use your touring kayak for sea fishing or trolling, there are 2 rod mounts so you can run 2 lines. The design is common for the best touring kayaks: a nice slim body made of polyethylene plastic. This makes it easy to repair and worry-free to use in areas with obstacles. The body style also makes it easier to cut through all types of water conditions. There is also added UV protection. 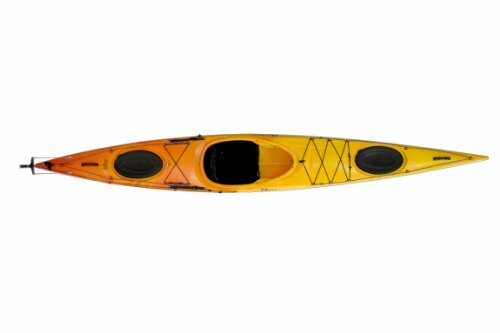 You can purchase this Perception Carolina Touring Kayak in either 12 feet or 14 feet. This gives you the opportunity to choose between a moderate and a large amount of storage space. Before purchasing, decide if you ever plan to do overnights. A yes answer means you need the 14-foot. This moderately slim v-shaped hull is made of high-density polyethylene for a worry-free, rugged experience. This design allows beginners to feel comfortable and stable, as does the easy-entry cockpit. Even the DLX multi-direction adjustable seat features ergonomic padding. In terms of storage, you get front and back dry areas and bungee cords to hold your gear. The Carolina Kayaks are rudder compatible, but you have to purchase it separately. As is, these Perception crafts are best used in calm waters such as lakes, ponds, and calm coastal areas. If you don’t feel comfortable in sit-insides, Sun Dolphin has the answer. The Bali SS is a 12-foot sit-on-top kayak that can be used for touring. The design is not as slim or narrow as sit-inside hulls, but you get maximum stability with good tracking due to the length. For storage purposes, there is a portable accessory carrier for longer trips. There is also a storage compartment and shock cord bungees to add a crate or gear. The maximum weight limit on this 51-pound kayak is a full 350 pounds. Did we mention this Sun Dolphin is easy to carry? In terms of comfort, the Bali SS features adjustable foot braces, paddle holder, and thigh pads. The seat itself is comfortable, even for taller people. 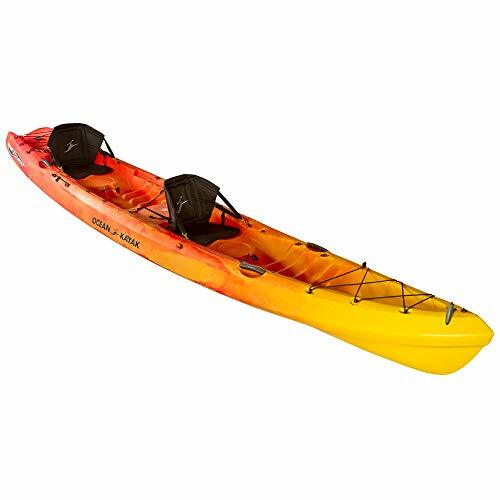 Additionally, the exceptional stability of this kayak is great for beginners looking to get their paddles wet! The Ocean Kayak Zest Expedition Kayak is the longest at 16 feet and 4.5 inches. It is also the only tandem touring craft on this list! Moreover, you and your partner can sit on top of this kayak. If you have a child or a pet that wants to join, the Zest Expedition may be perfect for you! 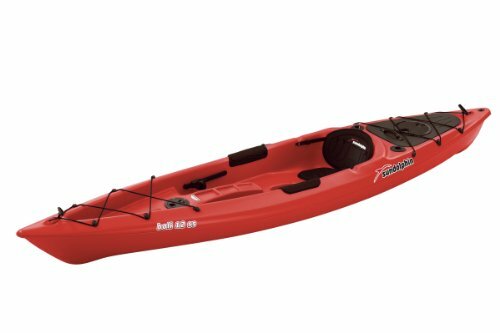 You can fit up to 600 pounds of people, pets, and gear in this spacious tandem kayak. Luckily, there is an adequate amount of storage room for everyone’s stuff: an oversized tank well with bungee for additional gear! The foot braces are molded in, so they are not able to be adjusted. However, the seats are comfortable! There are also molded cup holders and two mounted paddle holders. In terms of carrying this 87-pound kayak, everyone can get involved with the side, bow, and stern handles!